email below and click join! 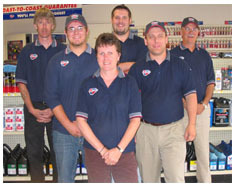 Welcome to Quest Auto Supplies your Carquest Dealer in the Yarmouth area. At Quest Auto we pride ourselves on quick delivery of our product and exceptional customer service. Our staff is well trained in the automotive business and are more than willing to go the extra mile in order to make sure that you get what you need when you need it. Quest Auto is the Irving distributor for Yarmouth County. We at Quest Auto Supplies are pleased to announce that 100% of our inside staff are ASE certified parts specialists. Ask about our bulk oil program. Check out Autoenginuity OBD2 scan tool only from Carquest (check out site on links). There will be a 2 night course on Evap systems hosted by Dave Giles on March 28th and 29th. Contact Jeff for more information page) Glasurit 90 line of waterborne automotive paints now in our warehouse.